Cajun & Creole cuisine are a couple of my favorite types of food to eat. These cuisines are similar to each other but also quite different, which is something I learned a few months back from my friend, ex-Army veteran, Derrill Guidry. He is a great cook from Louisiana and should know such things, so I trust him. Also on his food page, The “G” Spot, he displays his skills in the Cajun and Creole arena. Both of these cuisines have roots stemming from French cuisine, along with influneces from Africa, Spain and to a lesser degree a few other countries. One of the major differences between Creole and Cajun food is in the type of roux (pronounced “roo”) used as the base of sauces, soups, stews, and other savory dishes. Creole roux is made from butter and flour (as in France), while Cajun roux is made from lard or oil and flour. Most people have the misconception that all Cajun food is spicy, which is not the case. 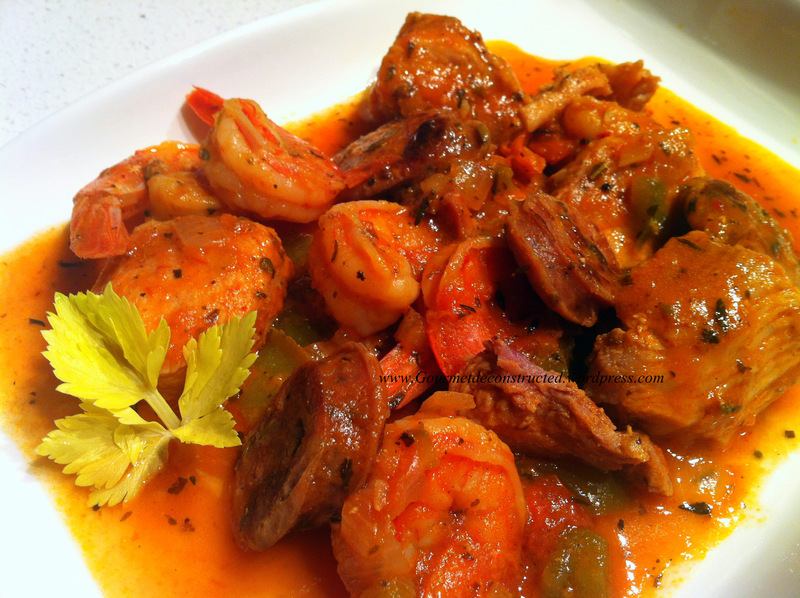 There are a few more differences, and I hope to cover this subject in more detail in a later post, but right now let’s get on with tonight’s dish: Alligator & Shrimp Creole! Now most of the people I know (excluding chefs) hear the word “alligator” and run for the hills! They wont go anywhere near it, even when it is cooked — and no longer baring teeth. 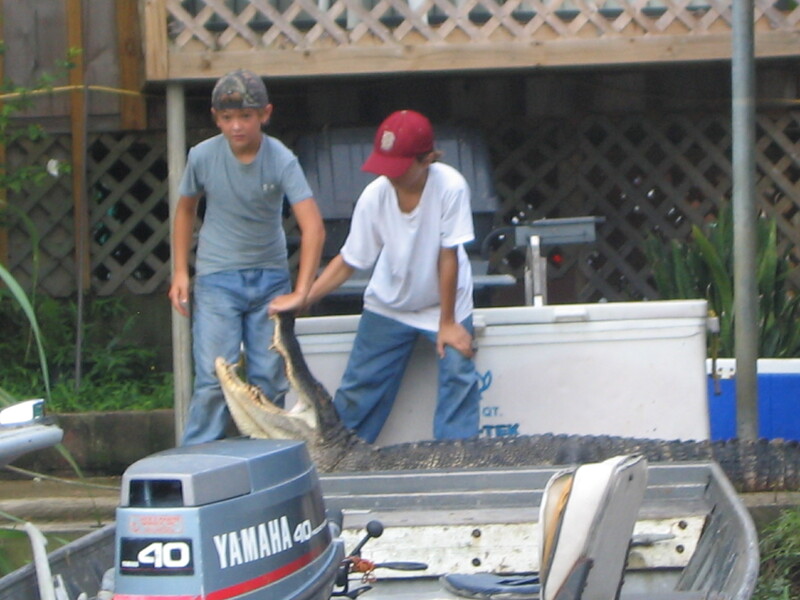 The fact is, alligators have been hunted and consumed by humans for centuries. The tenderloin I purchased looked no different from boneless chicken cutlets (certainly not green and slimy like some of you think). There are two different species of alligators, one in North America and the other in China. The Chinese alligator is listed as a critically endangered species, while the American alligator is plentiful, and can be found throughout the Southeastern United States. Louisiana and Florida have the most alligators: over one million wild alligators in each state with more than a quarter million more on alligator farms. Obviously, I will use farm raised alligator, and obviously an alligator from Louisiana since it’s Creole. The meat yielded a mild taste somewhat like chicken, and unlike its wild counterpart, which I am told tastes a tad bit more like frog legs or fish. The soft texture is sometimes compared to veal. While this wasn’t my first time cooking gator, it was my first try at a Creole-style dish and it was just absolutely delicious! The Creole flavors where exciting to the taste buds and the alligator and shrimp cooked to perfection. Bon Appetit! Mix together oregano, salt, white pepper, black pepper, cayenne pepper, thyme, and basil in a small bowl; set aside. Brown the sausage slices is a small frying pan and set aside. 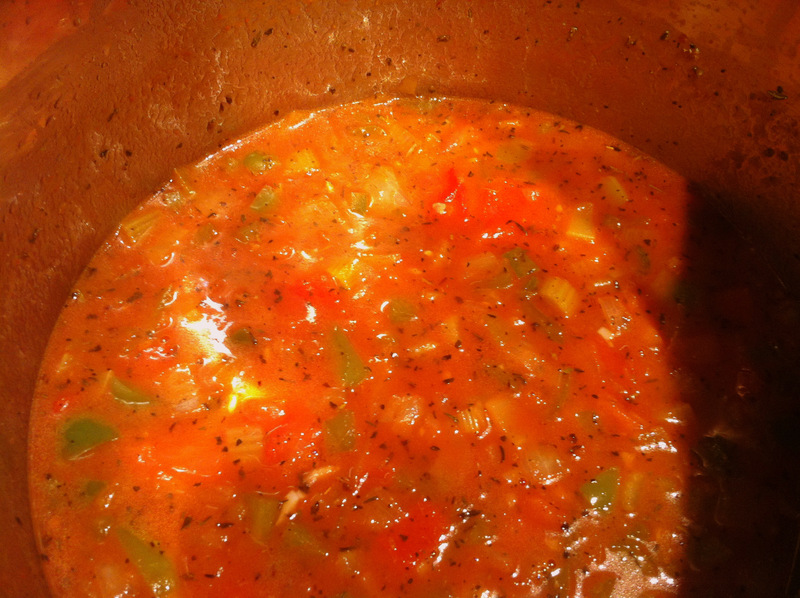 Melt butter in a large saucepan oven over medium heat; stir in tomato, onion, celery, green bell pepper, and garlic. Cook and stir until the onion is almost translucent, about 4 minutes. Stir in chicken or fish stock, tomato sauce, Worcestershire sauce, sugar, hot pepper sauce, and bay leaves. Reduce heat to low and bring sauce to a simmer. Stir in seasoning mix and simmer until the flavors have blended, about 20 minutes. Gently stir in shrimp and alligator; bring sauce back to a simmer add sausage and cook until the shrimp and gator are done, about 20-30 more minutes. Remove bay leaves and garnish with yellow celery leaves or parsley. Serve with a crusty bread or rice. Posted on May 15, 2012, in Seafood, Wild Game and tagged alligator, cajun, chicken sausage, creole, New orleans food, shrimp. Bookmark the permalink. 8 Comments. Well, to an ignoramus like me, this looks like an awfully appetizing jambalaya [don’t kill me, please!] and the alligator does not perturb me one little bit. If there are so many in Louisiana, why on earth are they not legally and judiciously culled [this is what we do with the kangaroo in Australia] rather than farm them? Farmed fish/animals of this sort are never as healthy [see Alaskan salmon v Atlantic salmon, which I won’t touch easily] as those in excess and humanely killed in nature . . . Beautiful recipe anyhows . . .
Well Eha, they are hunted legally here. I buy most of my game meat from http://www.fossilfarms.com. The animals are not mistreated nor are they raised on steroids. Thanks for the info 🙂 ! It’s the ‘steroids’ etc bit that, as a medico and nutritionist worries me. Do dislike the antibiotics and unbalanced foods which many farmed animals, including fish, still get here, even tho’ supermarkets/speciality stores increasingly state their produce is free of the stuff! I absolutely agree with you Eha! that is why Fossil Farms is my “spot” for game meat 🙂 thanks for visiting and commenting my friend. Great post Justice. Thanks for the lesson in Southern American food too. It looks and reads really great. Brother Justice, I bow to you on this dish…it is AWESOME! This look so good that you made this Louisiana Creole country boy shed a tear…hahahaha! Let me tell you, when it comes to cajun/creole food, you inspire me Bruh!